This article was originally published as a guest piece on The Click Hub’s blog here: https://theclickhub.com/the-seo-benefits-of-shopify/. The Click Hub are a digital marketing agency based in Exeter & Devon. Shopify is a hugely popular website system for business owners who want to sell their products online. In my many years of working in the industry, I’ve seen the platform go from strength to strength, changing with the times to remain useful for businesses of all sizes. Some of our customers use Shopify to sell a few products here and there, whilst our biggest customer sells £150k worth per month! This certainly would not be possible without Shopify supporting SEO best practices and providing a strong foundation of marketing capabilities. So, what are the SEO benefits of Shopify? You can edit the meta information, like page titles and descriptions right from within the Shopify dashboard. This means that you’re unlikely to need a web developer to write code for you and can really fine-tune your keywords on a per-product or per-category basis. Right from within your Shopify settings, you can sync your inventory up to Google Shopping, so that your products appear within search results. Of course, you’ll still be best served by working with a digital marketing agency (like The Click Hub!) so that they can optimise your adverts. But the good news is that the functionality is built-in, saving your developer time! One of my top tips is to integrate a good review app into your Shopify store. There are tons of apps to choose from, all of which can be plugged-in to your Shopify store. Make sure you get an SEO friendly one! 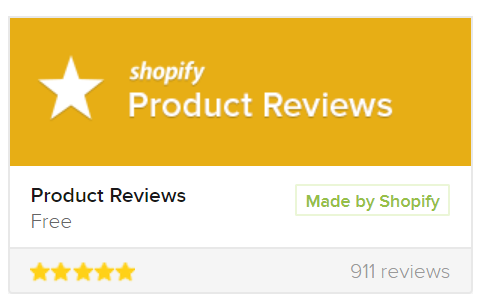 The Shopify Product Reviews app is free! It’s no secret that “content is king” when it comes to digital marketing. So it’s not a surprise that your Shopify store will be more successful when you use the inbuilt blogging feature. When you write articles and create pages, they’ll automatically be added to your “XML sitemap” which is a special file that Google needs to index your site. So, once again, you can focus on writing and promoting your store whilst letting Shopify handle the boring technical aspect. With that said, it’s nevertheless advisable not to neglect the benefit that a digital agency can bring to the table in optimising your blog content and building page authority. Beyond the four benefits listed here, there are of course a ton of advantages to using Shopify. But why should you listen to me, eh? After all, we make our money by creating beautiful Shopify website designs for our clients. We may sound a little biased, right? However, I’ve dabbled with many platforms in my 8+ years in the industry and nothing I’ve tried can compete with the ease-of-use and value-for-money that Shopify provides. If you are going to seriously consider SEO as a marketing strategy for your site, then you’ve got to try the platform. Get in touch if you’d like a special, no-limit free trial of Shopify.